It's spring break around here which means three children in need of constant entertainment. I have decided spring break is simply a trial run for summer. How am I going to keep these kiddos busy all summer?! At least it will be warmer than 40 degrees and won't be snowing (I hope)! 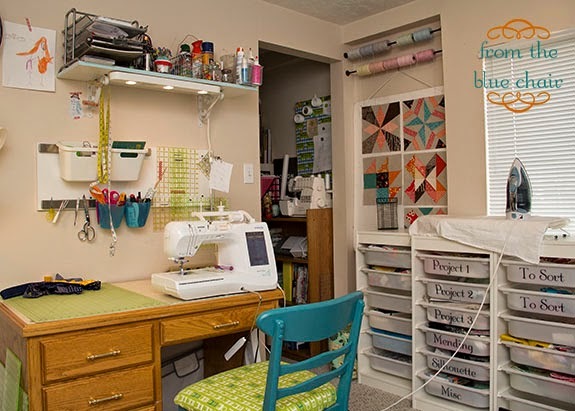 After Sew South my sewing room was a disaster. I just unloaded my bags and dumped stuff everywhere. There was no room to sew. I decided before I could jump into a new project, I had to clean up around here. I should have taken some wider shots during the actual cleaning process. It was pretty amazing how deep it was in here. I unloaded each drawer and sorted everything. I ended up throwing out a whole garbage bag of stuff. 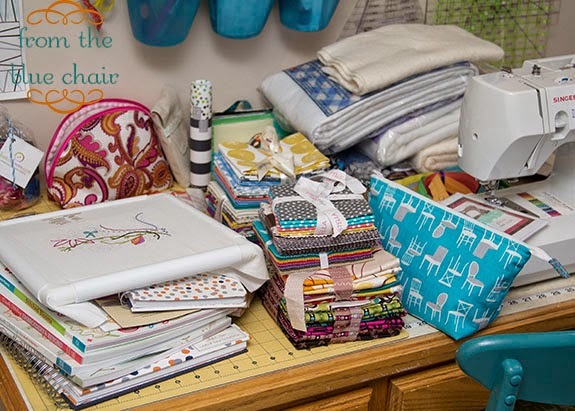 My little sewing area is small, and I have to stay on top of it, or pretty soon it becomes almost unusable. In addition to a clean and organized sewing room, my machine is back from a trip to the spa and works so much better. She gets really grumpy when it's been too long. Now she's good as new! Finally, I need to make new labels for my bins as I have changed up my system a bit. That will be a project for next week when the kids are back in school. Finally, on the design wall this week! Here is a peak at my App Quilt. This quilt was inspired by a drawing my daughter made of a pretend cell phone. Each colorful square was for an app on her "phone". I loved how it looked and almost immediately started turning it into a quilt. I actually intend to write this one up into a pattern. It's a simple design and beginner friendly. I have realized I miss writing patterns. I hope to get two completed before summer hits (when nothing will be accomplished for three months). More on the App Quilt soon! Love the bright, cheerful colors on this. Thanks for sharing! Loving the app quilt, and good luck with the in-house entertainment! I really like the app idea! Very clean and yet colorful...and good luck with the kiddos! My friends and I were just talking about Spring Break being a trial run for the summer, then the long break doesn't come as such a shock to us!! I love the app quilt - the bright colors are so fun and what a great source for your inspiration!! Oh I haven't unpacked yet- this weekend for sure. I remember those days with little ones at my feet. My last one is 16-1/2 and now has a job for the summer (at the pool!) so I don't think anyone except my dog will be under my feet! 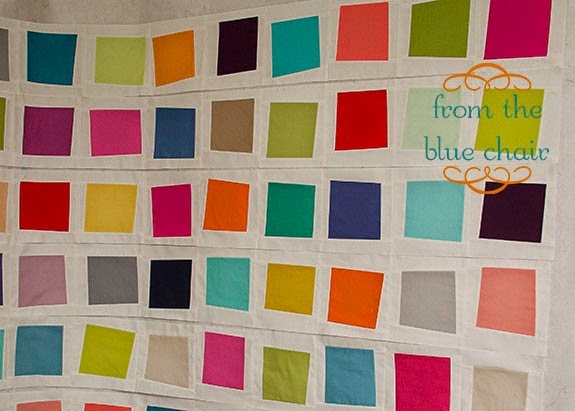 That would be a great quilt to practice all sorts of different FMQ designs on!